Miramar Beach Villas consists of 20 townhomes nestled in a small town center atmosphere on a gated cul-de-sac street. A few steps from our home you can relax at the Tropical pool surrounded by landscaped grounds. Take a few more steps and you'll be at the private beach access. Our two story 3BR/3BA + Bunk alcove Villa comfortably sleeps 8. 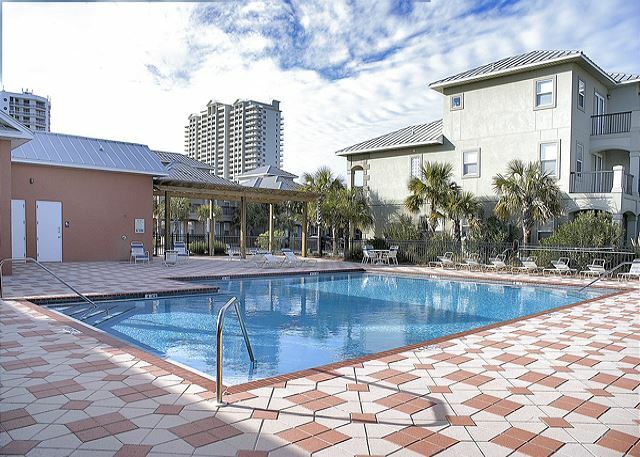 Spend your time away at the tropical community pool or spend the day at the beach. This townhome is like new! Large spacious common area (living room, dining area, kitchen with breakfast bar). Granite countertops in kitchen and bathrooms! Private balcony on second floor (west side balcony provides view of sparkling waters of the Gulf of Mexico!). Living area features flat screen TV and surround sound stereo! Free internet, cable, and phone! This intimate beachside community is located just west of Sandestin, close to Silver Sands Outlet Mall, Baytowne Wharf, fishing, golfing, dining, and shopping. It is the ideal Beach Resort!